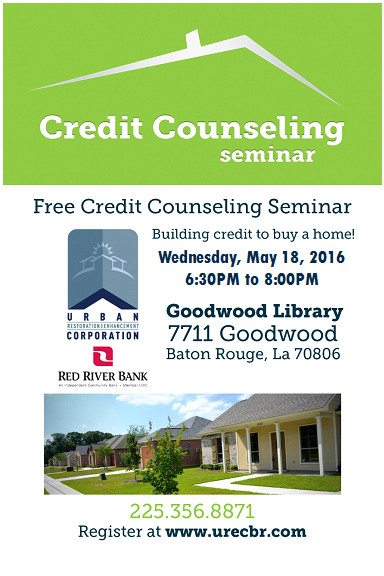 Urban Restoration Enhancement Corporation in partnership with Red River Bank will host a free Credit Counseling Seminar on Wednesday, May 18, 2016 at Goodwood Library, 7711 Goodwood Boulevard in Baton Rouge. Crystal Casher, Community Outreach Specialist-Mortgage Lending, at Red River Bank will facilitate the educational component of the seminar, which is geared towards helping individuals build and repair credit for homeownership opportunities. Advanced registration is required for the seminar, which is free and open to the public. Please register online or at http://goo.gl/forms/6k4Y3vFYtf. For more information, call (225) 356-8871. The mission of Urban Restoration Enhancement Corporation is to “transform communities by investing in people and restoring neighborhoods.” UREC is a nonprofit community development organization. Learn more at www.urecbr.com.